I now know why it is a best seller! 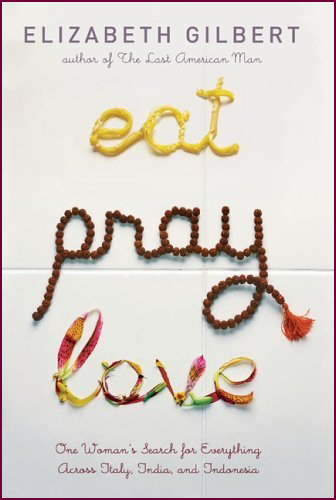 You will simply fall in love with the characters, the story and the places that Elizabeth Gilbert takes you to in her amazing book, Eat, Pray,Love. I must admit, I have never wanted Pizza more greatly in my life. I do love the doughy, cheesy goodness of Pizza but the intricate, immaculate and almost sensuous way that she is able to describe the pizza of Italy makes you crazed for it! I have not yet been to Italy and have always wanted to visit. After reading this book, I am so glad that I did not rush my trip and do a mere few days running around one of the major cities snapping away at all the main tourist attractions and grabbing as much gelato as humanly possible. I will wait patiently now for a time when I too can really experience the beauty of Italy, and hopefully learn the language before I embark on my own Italian escapade. The book is divided into three parts, Italy, India and Indonesia. The three “I” countries where Elizabeth spent her year of pleasure, self exploration and individuality. Where she grew to be herself. I think it’s a phenomenal adventure, and courageous thing to do. To leave everything you know for one year and to set out with a plan of only seeking yourself. She is not looking for the love of another, but the love of herself. And I love that! I’m excited to read on, and no doubt you will have more posts from me in the coming weeks about this fabulous book and the ideas she explores as she explores the world. Visit her website or pick up the book! I haven’t yet been to Cambodia so you can beat me to it! ActionAid Australia are offering a wonderful once in a lifetime experience to visit Camobodia on a Cycling trip and see some of the wonderful work they do there. It’s a 10 day adventure, 6 days of cycling through the breathtaking countryside of Cambodia, where you will visit the incredible ruins of Angkor Wat, and the vibrant city of Phnom Penh. After that you will spend several days at one of our current projects, working alongside the local community, sharing their hardships, their progress and their joy first-hand as you work in partnership to change their lives for the better. These First Hand Experience adventures raise between $40,000 and $100,000 on average which will make a massive difference to the communities. How fantastic is that!! I’m so impressed by this initiative and think the work that Action Aid do is fantastic in any case. Travel is wonderful, but travel with a purpose and a passion is so much better!! ActionAid Australia, a global anti-poverty agency, has been working in Cambodia to help farmers and their families create and build sustainable farming livelihoods. Since 2006, ActionAid has worked with these communities affected by landmines. The focus of ActionAid’s community development projects is now on increasing incomes through better farming techniques, training farmers in important business skills, such as selling and negotiating prices for their produce, and the benefits of rain tanks, water storage and management knowledge so that the productivity of farmers continues to rise. Visit the website and download the info pack for more details. Sadly I won’t be able to head their this time but will be following the blogs closely to see what they get up to!! This project is being run be the AWESOME team at Inspired Adventures! Geez i love the work these guys do!! Go Team! !